Water Filtration Systems for Your Whole House, Pure Drinking Water, Water Coolers. Safe, Healthy Chemical Free Water! Most effective Chloramine Reduction on the market! Standard 53 for cysts, VOCs and more - including carcinogenic chlorination byproducts. All our water filters are Made in the USA by Selecto Scientific, Inc. - the water filtration choice of Coca~Cola® and Pepsi Co. worldwide. Why do the world's largest beverage producers choose water filters by Selecto and why you should too? Is by far the most efficient media to reduce Chloramines (chlorine plus ammonia, also known as Combined Chlorine) used in most medium to large cities. Superior reduction of: Chlorine, Chloramine, sediment, bad tastes & odors: ammonia, hydrogen sulfate, metallic tastes, Cysts: Cryptosporidium, Giardia, Entamoeba, and Toxoplasma, THMs, *VOCs, MTBE, Organics, Tannins. Guarantee keeps yearly costs consistent. Fast and EZ Do-It-Yourself installations! Allows cartridge replacement in a snap, with no tools required. No more maintenance calls! Whole House Water Filtration System fits easily into a crawl space. Click the Graphic below to find the type of filter that meets your needs. Filter the Whole House for Healthy Living! You absorb more carcinogenic chemicals in the bath and shower than you do drinking water! Protect your family and your plumbing and appliances with the Contamin-Eater. Cart. Bottled Water is Expensive and Wasteful! Legacy Point-of-Use Drinking Water filters give you more than enough pure water for drinking and cooking than you could possibly use in a whole year. How much cash could you save if you only paid 2 1/2 cents per gallon rather than buying bottled water? Cart. That bottled water delivery is expensive, takes up a lot of storage space, is usually put in toxic polycarbonate bottles, and is an ecological insult. For pennies per gallon you can filter 140-300 gallons of drinking water for your water cooler or crock. Cart. 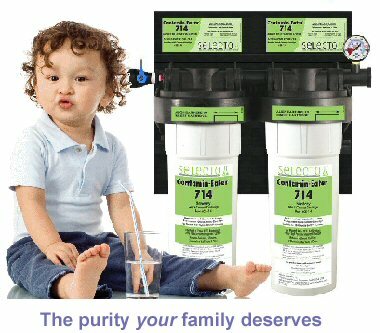 The Industry's First and Only Performance Guarantee: Selecto warrants filters that are installed and sized correctly to last for the rated capacity, and we will replace the cartridge at no cost during the first three months of use and will pro-rate replacements for the remaining period (3 or 9 months) giving fixed operational costs, regardless of water quality or location. ezClearwater.com is the Authorized Distributor of Selecto, the Industry Leader in Filtration Technology. © 2007-2011 ezClear Water. All rights reserved.